Park Model Homes offer versatile and comfortable RV living at an affordable price. 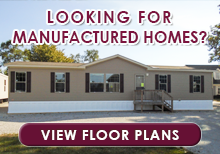 Enjoy perusing our exciting collection of non-loft floor plans. Park models, popularly referred to as ‘Tiny Homes’, represent the most sensational addition to the recreational and seasonal housing market since the introduction of fifth-wheels & campers. High demand features include bay windows, porches, cabin style finishes and clerestory windows. Click on “Learn More” for model photos, details and standard specifications.